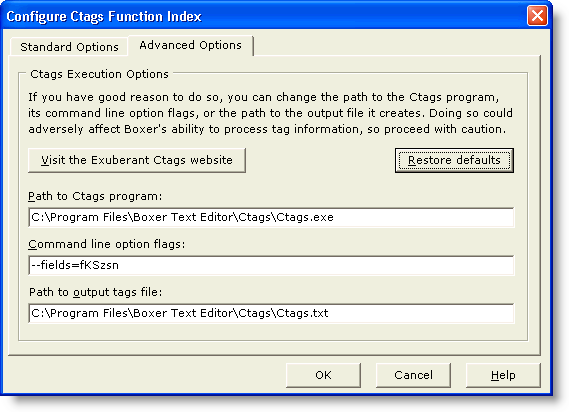 The Configure Ctags Function Index command provides options that relate to the Ctags Function Index feature. When this option is checked, indexing information will be gathered for all files that are open for editing. If the Auto-index on startup... option is checked (see below), this indexing will occur automatically shortly after startup, and files that are opened later in the editing session will be indexed as they are opened. If the Auto-index option is unchecked, indexing will not occur until and unless the Ctags Function Index command is issued. When indexing files that are open for editing, please note that the operation is performed on the file as it resides on disk, and not on the memory image of the file. If you have made changes to a file that you want to be reflected in the index, be sure to save the file before requesting the indexing operation. When this option is checked, files named in the accompanying list will also be indexed, even if they are not open for editing in the editor. Use this list to name files that you would always like to be indexed, even when you're not editing these files. The edit box below the list is used to enter the full filepath of the file to be added. Click the Add button to add the file to the list. Use the button with the ellipsis button (...) to browse for a file. The Delete key can be used to remove an unwanted entry from the list. Right-clicking in the file list will display a context menu, which additionally contains options to Edit the selected entry and to Delete All entries. When checked, this option causes the Ctags Function Index dialog to remain on top of other windows. This option controls whether or not grid lines will be displayed between rows and columns in the Ctags Function Index. Use this option if you prefer that full filepaths be displayed in the Ctags Function Index. This option is useful when you're editing files that have the same filename, but reside in different directories. Use this option to ensure that popup function prototype tool tips can be displayed even if the Ctags Function Index command has not been issued. An indexing operation must be performed before function prototypes and global variable information is available for display in either the Ctags Function Index dialog, or in popup tool tips. Depending on the number of files open for editing, the number of extra files designated for indexing (see above), the size of these files and the processing speed of your computer, this operation could take anywhere from a split second to several seconds. On modern PC's, and with source files of modest size, the indexing process will be almost instantaneous. However, if you're using a slow PC, or you typically edit many files at once, or your source files are exceptionally large, you may wish to disable auto-indexing. For most situations, the added convenience of having popup information available will outweigh the split-second indexing process. If you have good reason to do so, you can change the path to the Ctags program, its command line option flags, or the path to the output file it creates. Doing so could adversely affect Boxer's ability to process tag information, so proceed with caution. You can use the Restore defaults button to restore the settings to their recommended values. 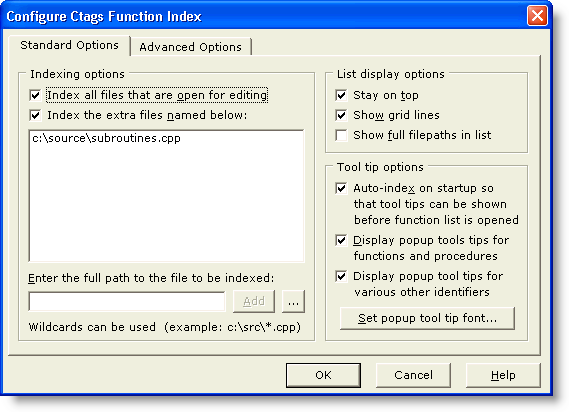 Exuberant Ctags supports a comprehensive set of command line option flags. With some experimentation, they can even be used to add support for indexing languages not supported by the program in its as-released form. Full information about the Ctags program can be found at the Exuberant Ctags website.